Who’s this mysterious figure, and what could he (or she) want? The characters appearing here are Irene Polkinghorne (manager of The Shivering Timbers), Dirk Jort (bartender of the Oily Bicep®), The Supervisor (supervisor of Shell Inlet), Rhubarb Johnson (occupation unknown), The Green Pirate (captain of the Swampscott Pirates), Governor Carl Woodes (governor of Crook Island), and Marianne Brigham (Jenny’s mom and owner of The Shivering Timbers). Fun to see some of ’em again! 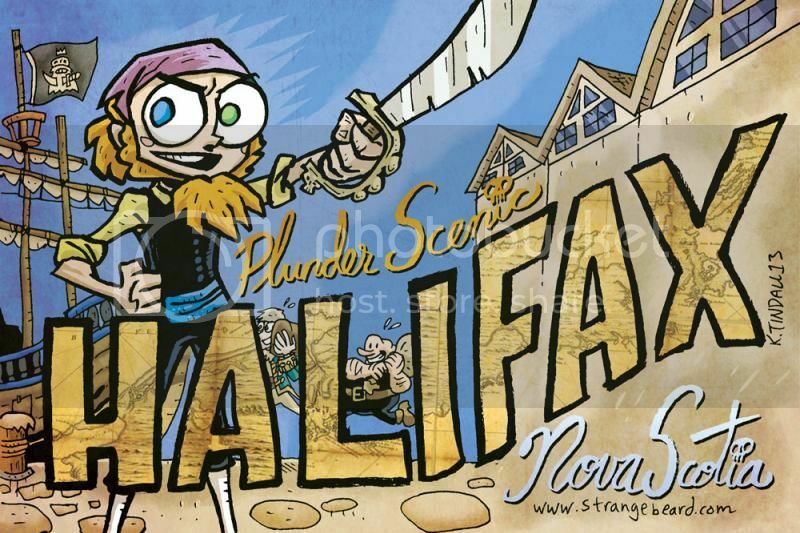 Here’s the exclusive postcard I made for Hal-Con in Halifax this coming weekend. Very limited quantities, so if you want one come early.